Beautiful surroundings, excellent service , friendly staff. Nice sitting area outside and nicely kept grounds. I visited for a wedding held at the property so it was a good one stop shop. Booking, checking in/out was easy and staff were nice enough. The bed and pillows were adequate. The room smelled. The bathroom had a very damaged vanity unit. Taps in shower weren't working well. Toilet wouldn't flush. The walls are very thin and you can hear other guests at night time. Guests in other rooms were having very loud arguments in the early mornings. Wedding guests were very loud all night. The cleaners do there best for everyday cleaning. Things are often in need of repair and the staff are accommodating about getting things taken care of. The location was great, room and bed comfortable, but the house cleaning was hit and miss and replenishment of coffee and toiletries did not happen. Atmosphere. Larger size rooms. Nice grounds.dining is good. Large trees. European feel. Nice grounds, rooms and outside need a good revamp. St Francis Winery This rating is a reflection of how the property compares to the industry standard when it comes to price, facilities and services available. It's based on a self-evaluation by the property. Use this rating to help choose your stay! 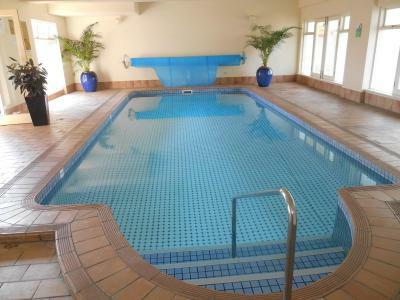 Set among picturesque gardens, St Francis Winery features an indoor swimming pool. It offers free WiFi and free parking. Guests can dine at the on-site restaurant and a bar. 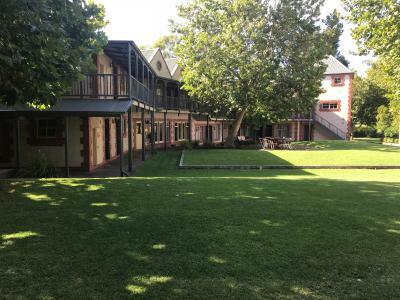 This historic venue is just 15 minutes’ drive from Seacliff Beach and 20 minutes’ drive from McLaren Vale Region. Adelaide City Center is 30 minutes’ drive away. Accommodations options include self-contained apartments and suites. All room types are air-conditioned and feature a flat-screen TV with cable channels. They offer a mini-bar and tea and coffee making facilities. The private bathroom includes a hairdryer and free toiletries. When would you like to stay at St Francis Winery? This suite is air-conditioned and offers tea and coffee making facilities. There is a flat-screen TV with cable channels. The private bathroom includes free toiletries. This apartment is air-conditioned and offers a kitchenette. The lounge area includes a flat-screen TV with cable channels. This suite features a spa bath and a flat-screen TV with cable channels. It offers tea and coffee making facilities and free toiletries. House Rules St Francis Winery takes special requests – add in the next step! A AUD100 damage deposit is required on arrival (around USD70.12). This deposit will be fully refunded 14 days after check-out, as long as there isn't any damage to the property. St Francis Winery accepts these cards and reserves the right to temporarily hold an amount prior to arrival. Check in must be completed by 12:00 midnight. Please note that you cannot check in after 11:00 on Good Friday, 3 April. Please note that you cannot check in after 15:00 on Christmas Day, 25 December. The reception will be closed. A damage deposit of AUD 100 is required on arrival. That's about 70.12USD. This will be collected by credit card. You should be reimbursed within 14 days of check-out. Your deposit will be refunded in full by credit card, subject to an inspection of the property. Please inform St Francis Winery of your expected arrival time in advance. You can use the Special Requests box when booking, or contact the property directly using the contact details in your confirmation. Given the photos we saw on booking.com we expected a nicer looking room. The bed was very uncomfortable. The property has lost its meaning. This is more like a cheap motor in, rather than a winery. There was a room full of pokies at the front, which was nowhere to be seen in the advertisements, which no doubt is a profiting from retirees pensions. The bedrooms were shabby, the bathroom had cracked tiles and was falling apart. The window was broken and wouldn’t close so it was hard to stop the noice from people walking by. Two nights out of three, other guests were extremely noisy so we didn’t get much sleep. The one room was in a corridor so it got no natural light. The other room had fake eyelashes on the floor, there was lipstick on the mirror. The bed was jammed into one corner of the room. The kettle was rusting out. The furniture was cheap and old. Needs a freshening up. The Duck pond was nice. The sheets appeared to be clean. Bed was a bit soft. Passageway to stairs to room had no lighting in dark. I booked in hopes of being a vineyard, its not a winery hence the name. Upgraded online for a ground floor apartment for 2 night's. A night time cinema was on but we couldn't go due to tickets all sold out, would of been nice to have a place as we stayed there, so 1st night all we could here was this cinema playing and couldn't walk around the grounds. All we could here from above units were doors slamming closed all night,and thumping. couldn't sleep at all, after midnight went to reception and we were moved to another room (downgrade). 2nd night couldn't have dinner in dining room due to full (small dining room). So went to The Crown Hotel. Housekeeping were loud out front of door that has 'do not disturb' sign on (after a late night not being able to sleep). Once staff were aware of noise, we were quickly sorted with a different room and given a free buffet breakfast for 1st morning. The grounds are lovely, lots of trees. Only one chair for a room for at least two people. Try sitting on the edge of the bed for a couple of hours. Crap. Twice we were awoken in the middle of the night by unruly tenants swearing, arguing, bashing on their door demanding to be let in, around 2am. The next night we had people once again banging on a door, talking loudly, which went on for at least 1/2 an hour, once again around 3 to 4 am. I don't think other travellers will want to see this review. Location reasonable. Not much else. 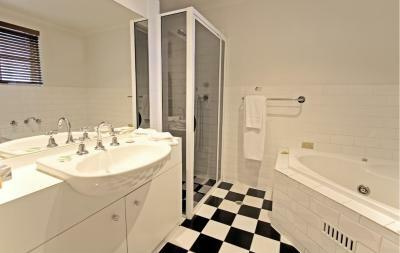 The room needs renovating, tiles were off in bathroom. The room was very sparse. the staff at dinner did not clear the tables and were slow to provide drink service. The location was nice and close to my family get together. The dinner was fabulous. Very close to my work place and good ambience.